The Sustainable Arts Society is a 501(c)(3) tax exempt non-profit organization offering artists the opportunity for quiet contemplation and intellectual productivity in a rural Appalachian setting. Residencies allow the artist to live and work through a self-directed program, in solitude and in community with like-spirited individuals away from the cares and turmoil of the contemporary, everyday world. 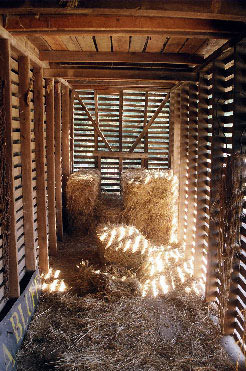 Light and shadow in the corn crib, one of the many original out buildings. These humble buildings were once part of a working settler's farm in Appalachia, and have been preserved and are in use once more on a working farmstead. From organic garden patches to milking goats for cheese, the agrarian, self-sustaining lifestyle is integrated into the artist residency program and everyday life. 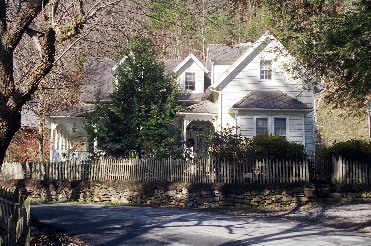 The Sustainable Arts Society at Blue Ridge is located on a restored 1885 historic farmstead situated on 16 acres along the banks of the Toccoa River in Southern Appalachia. This historic river crossing was used by the Cherokee Nation before the early settlers arrived, and the site continued to be a key crossroads as the region was settled by the new Americans. The river crossing has always been a place for the mutual exchange of goods, news and ideas between residents and travelers. "A wonderful place for finding inspiration in nature and history. My two week stay was the highlight of the last ten years." " Truly a unique part of our region and community, worth preserving. " "The place itself is inspiring! I'd like to write my next book here."